We are developing self-organizing systems of robots. 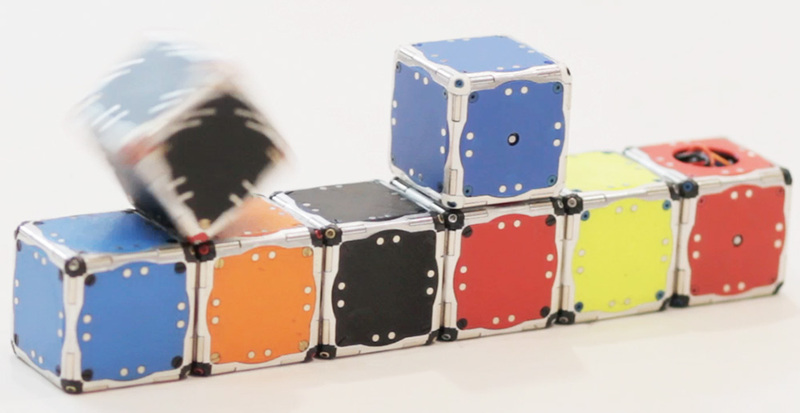 Self-reconfiguring robots have the ability to modify their geometry without human intervention. They take on the body shape most suited for the task at hand. The idea is to make a module or voxel that can move to sit on another voxel, then another, so that it can build different shapes. And eventually, the modules can turn themselves into a support beam, a tool, a robot with a different number of limbs, etc. We are developing new designs for self-reconfiguring robots and new planning and control algorithms to control the reconfiguration of the robot and its motion. We have developed a several approaches to self-reconfiguring robots including The Molecule Robot, the Crystal Robot, the Shady Robot, the Pebbles, and M-blocks. M stands for motion, magnet, and magic. Motion because the cubes can move by jumping. Magnet because the cubes can connect to other cubes using magnets and once connected they can move together; the cubes can also connect to assemble structures. Magic because the surface of the cube is very clean, we do not see.